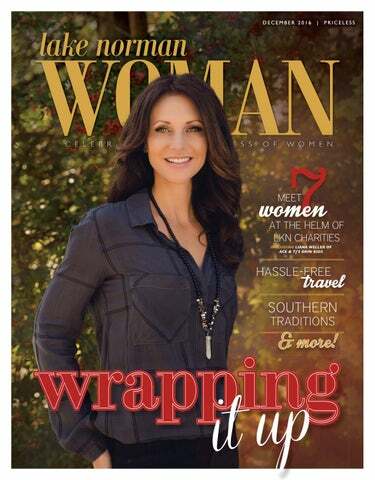 Ad Submissions: ads@lakenormanwoman.com Lake Norman Woman reserves the right to deny any advertisement or listing that does not meet Lake Norman Woman standards. Submissions are welcome but unsolicited materials are not guaranteed to be returned. Lake Norman Woman assumes no responsibility for information, products, services, or statements made by advertisers or editorial contributors. An advertised special printed in this publication is subject to change without notice. All rights reserved. Reproduction in whole or in part without written permission from the publisher is prohibited. SHE SAID WHAT: What Is One Unexpected Gift You Received That Touched You? Merry and Bright. Treat yourself to great skin for the holidays! Please visit our website for details on our current cosmetic specials. DON’T UNDERESTIMATE PLAIN BROWN PAPER. Use a scarf, bandana, or just decorative cloth to create a unique look. CONSIDER FABRIC. Simplicity with a red ribbon—perfection! GET BACK TO NATURE. Use a sprig of pine or pine cones to adorn your gifts. But be careful with mistletoe as it can be poisonous if ingested, especially for pets and children. ADD CANDY AND SMALL GIFTS. You can tuck a candy cane, smaller-wrapped present, or perhaps a homemade goodie to the top of your package. patterns and baskets abound, so personalize those gifts. How about a spa basket full of facial scrubs, a manicure kit, and an aroma candle? Or perhaps a Panthers footballthemed basket—especially if you have tickets to give! Have the kids draw and create their own. Family members will appreciate the special touch. Or create a picture montage in a Word document and print out on regular or legalsized paper for wrapping smaller gifts. For additional creative gift giving and wrapping ideas, visit www.pinterest.com. Great deals on all of the brands you love! Free cards cannot be used until January 1, 2017. Make separate piles for each to begin the decluttering process. And donate or sell immediately; the longer it hangs around the more likely you are to keep it. Alleviate unnecessary papers by subscribing to paperless online billing, scanning and saving receipts on your computer, and storing documents and files electronically. These options are very reliable with proper backups. Ask yourself: Do I need it? When was the last time I used it? Will I need it in the foreseeable future? Paper and dust mites dwell in stacks of papers, files, and books, so make it a habit to clean, purge, and disinfect on a regular basis. If you actually see it on your todo list each week, it is more likely to get accomplished. The point is to “get rid of” not “add to,” so don’t go buy new filing cabinets or storage bins, which defeats the purpose. Organize the mess of cables. Cords and cables are unsightly and provide more surfaces for dust and dirt. You can use rain gutter segments to hold cables. Also, check out products specifically designed for hiding them such as IKEA’s Signum line or Cablox. On average, televisions are used for fewer than two years, and for computers, it’s three. Recycling your electronics is critical for preserving landfill space and ensuring that hazardous materials are disposed of properly. Visit www.ecyclingcentral. com for more information and for local recycling centers. For more information on a productive work environment, visit www.forbes.com. o you know someone with cancer? Chances are that you do, considering as many as 1 in 2 people will be diagnosed at some point in their lives. sk just about anyone in the Lake Norman community— and many others within our region—and they know what Ace and TJ’s Grin Kids is. They’re familiar with the local radio personalities and their annual trip to Disney World with terminally ill and chronically handicapped children and, of course, those heartfelt grins on the faces of the children, the families, and the volunteers who get to participate in this incredible, once-in-alifetime experience. But what they may not know is that the nonprofit, Grin Kids, is just that: a separate 501 (c)(3) charity started by two guys who happen to have a successful radio show. And that nonprofit is run by Executive Director Liana Weller right here in Mooresville. “I got a phone call out of the blue from TJ,” Liana says. “I’d been involved in several community fundraising events, but at the time, I was trying to figure out what my next personal career move would be. I’d been involved with Big Brothers, Big Sisters for years, both in Houston and Pittsburgh, that were very meaningful to me. My Little Sister in Pittsburgh is now in her 20s, and I still keep in touch with her. So, I knew I wanted to work with children.” At the time, Liana did not know TJ personally and was surprised her name had even come up from multiple sources when Ace and TJ were looking for someone to run their nonprofit. “What a gift I have,” she says, “to be able to get up every day and be part of making the day for these families.” Making someone else’s day is important to Liana, along with her husband, Todd, and their 13-year-old twins, Mallory and Aiden. While the annual Disney World trip, which celebrated number 17 this year, lasts five days, it takes the rest of the year to make it possible. To make it “magical”—a goal, written right into the nonprofit’s mission statement. The trip is funded solely by individual and corporate donations and fundraiser events, such as this month’s Breakfast with Santa and a golf tournament, held each June. And while one may think that parts of the trip are comped by the larger corporations, they are not. Grin Kids pays for everything, including the hotel, transportation (yes, airline fees! ), and meals for these families. Anyone who’s traveled can empathize with the challenges of preparing for a flight—but try organizing such logistics for 37 families (this year)! opened Salon Zéle in Mooresville. Racheal is a graduate of the Paul Mitchell School, and the Vidal Sasson Academies in Manhattan and Los Angeles, respectively. Salon Zéle is located at the intersection of Brawley School and Williamson Roads. owner of Hudson & Lee Honey Simple Syrup, an all-natural and handcrafted beverage item used as a cocktail and beverage mixer. Among many regional locations, Hudson & Lee is available at the Old Store Produce and the Sanctuary at Davidson. of HollyzHope, a nonproﬁt with a mission of providing fencing to free dogs from the chain life. This organization operates solely from volunteers and donations, and also offers dog houses, spay and neutering, and basic dog supplies, such as food, straw, bedding, and toys. director of Angels & Sparrows Soup Kitchen in Huntersville, was recently recognized as the 2016 Nonproﬁt Champion of Diversity by the LKN Chamber of Commerce. 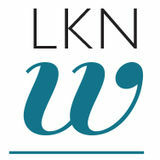 Sandy opened the soup kitchen in 2007, and is also an inaugural LKNW Woman of Will. Come get in the spirit and be entertained! Enjoy trolley rides, and shop among the vendors set up on the Green, along the streets, and in local businesses. Mrs. Claus will be conducting story time. Of course, you can make some time for Santa, too! All are welcome to attend this free, familyfriendly community event. There is something for everyone, including more than 400 Nativities from around the world, a stable with Nativity costumes, children’s crafts, and nightly musical performances from 4:30 p.m. to closing. All are invited to this free, lively, interactive, biblical-era drama and marketplace. Guests register for the census (and tour group). Guides lead the way through Bethlehem, and groups experience the very ﬁrst Christmas. Along the way, they meet the tax collector, merchants, and shepherds in the ﬁeld—and discover Baby Jesus in the manger! Enjoy photos with Santa, a tour of the veterinary hospital, an adoption fair, a basket rafﬂe, and an ugly sweater contest! Food and beverages will be available. This event will beneﬁt LKN Humane. The DCP presents Matt Merrell’s musical celebration of family, community—and a chance to rediscover the meaning of Christmas. The LKNW team dons boots--in anticipation of the cooler temperature. CHECK THE WEATHER. If you have a connection, pay attention to the weather conditions in your connecting cities, as well as at your departure and destination airports. Research ahead of time to determine which alternate ﬂights might work best. CHOOSE A MORNING FLIGHT. There are two good reasons for this: you are far less likely to have your ﬂight affected by problems at other airports; and if your ﬂight is canceled or delayed, your options for alternate ﬂights on that same day are much better. AVOID TAKING WRAPPED GIFTS. Security will have to open them, period. With the Transportation Security Administration searching checked bags as well as carry-ons, this applies to all of your luggage. CONSIDER SMALLER AIRPORTS. So often these days, the sheer number of travelers can bog down the busier, larger airports. FLY SOUTH. Consider booking your connection through a Southern city where winter weather is not as big an issue. For more travel tips or to plan a vacation, visit www.aaa.com. parents and health care providers about the risks of unproven commercial products. “Be particularly wary of devices that claim to reduce the risk of SIDS. Examples include, but are not limited to, wedges and positioners and other devices placed in the adult bed for the purpose of positioning or separating the infant from others in the bed,” the report stated. The bottom line is: No co-sleeping with your baby. infants sleep in the same room as their parents, but on a separate surface such as a crib or bassinet designed for infants. This is an update to the safe sleep policy since 2011, with the new guidelines recommending room sharing for at least 6 months—and ideally—up to 1 year. Room sharing can reduce risk of SIDS by up to 50 percent, per the Academy’s report. However, bed sharing is not recommended. Note that infants should still sleep on their backs until one year of age. with SIDS. Infants should be dressed in no more than one layer than an adult would use for the particular environment. Please always check with your child’s physician regarding any medical recommendations, and keep up with your child’s vaccinations. In the meantime, Merry Christmas, happy holidays, and a healthy, peaceful and prosperous new year to you and yours from Lakeshore Pediatric Center medical providers and staff! Wissam E. Nadra, MD, FAAP, AIHM, is the president and clinical director at Lakeshore Pediatric Center in Denver. He is a boardcertified pediatrician, also certified in integrative medicine. For more information, visit www.lakeshorepediatric.com, or call 704.489.8401. ‘Twas the night before deadline, Not a Scene photo in sight, Amy asked for an extension, But the schedule’s too tight. The stories are written, The sources are checked, The photos are beautiful, The proof, ready to inspect. So we scurried and hurried, And we read and we placed One last-minute ad, Our client needs replaced. While Stephanie and Michele Sold last-minute ads, Our other Michelle Eagerly compiled “New Year’s Fads.” changes, Chelsea designed and made all our s & praised us. While Leslie double checked comma Then Dana exclaimed, fuss! “Let’s put ‘er to bed! Let’s stop all the We’ve done it, Ladies, We’re good to go. Now Santa is ready, And it’s starting to snow.” We all say a prayer, As the order is tall: Make 2017 great; Merry Christmas to all! H i ll A ve. Receive a complimentary Laser Photo Facial when 25 units or more of Botox* is purchased. (Regularly $175) Must be used on the same day. *Ratio 1:1 Dilution guaranteed. Give the gift of confidence this holiday season. Purchase a gift certificate today, complete with a complimentary consult, to give that special someone a customized beauty experience. All services are performed by trained and certified RNâ&#x20AC;&#x2122;s. Appointments are required, no walk-ins. For applicable candidates, no other discounts or substitutions apply. Brilliant Distinctions can be used with this special. Offer valid December 2016 only. I found a 3-foot-tall Yogi Bear. And I was thrilled. Why? Well, when we were little children, our grandfather, whom we rarely saw, stopped by the house one day with gifts for us. Tommy got a Huckleberry Hound, and I got Yogi Bear. A few days later, Tommy was playing with both of the stuffed animals, and he left my Yogi outside. A rainstorm came through and … that was the end of Yogi. The real gift that Christmas many years later was his remembering the loss and his desire to set it right. It wasn’t really Yogi Bear that thrilled me; it was the strong relationship and love between my brother and me that the gift symbolized. Many trace this tradition of gift giving at Christmas back to the Wise Men and their gifts for the Christ Child. Do you remember those gifts—frankincense, gold and myrrh? Doesn’t sound like anything on the wish list of any expectant mother. And yet, when seen as symbols, those three gifts point to what was really happening in that birth. Gold for a king, incense for a priest, and myrrh for one whose death would be his greatest act of service. It seems to me that the very best gifts are not the ones that have a certain price tag or even those that have shown up on wish lists. The best gifts are the ones that celebrate specific people and specific relationships. The best gifts are symbols of something far greater. After all, that’s what this season is really all about: an incredible gift that pointed to God’s incredible love. It is exactly what makes a gift worth remembering. I’m hoping that in this season of gift giving and receiving, that might be true for you. In other words, I hope you give and receive lots of Yogi Bears. Rev. Jan Brittain is the senior pastor at Williamson’s Chapel United Methodist Church in Mooresville. THE MIND, BODY, AND SPIRIT ARE INTIMATELY CONNECTED. Because unhealthy thoughts and emotions can create a vicious cycle that leads to unhealthy physical patterns, we can choose a victorious path that includes a positive, healing, uplifting spiral. By mixing the ingredients of attitude and action, we can change the ﬂavor of our own lives. Learn to nurture your body and soul to lead a more balanced life.